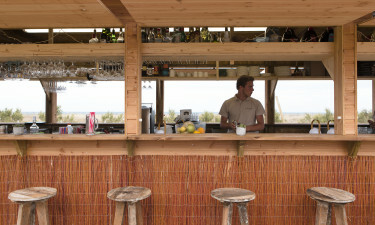 Les Dunes for seaside fun, relaxation & camping luxury in the south of France. Reserve your next holiday at Camping Les Dunes to guarantee your place at this super camping site in the south of France. On the Mediterranean coast between Perpignan and Narbonne, south of Montpellier, this fabulous new LuxCamp site is near the Pyrenees. Why not picnic in the dunes, swim in the sea or visit nearby Castelnou, one of France’s most picturesque villages? Alternatively, see the monuments at the fortress in Salses. 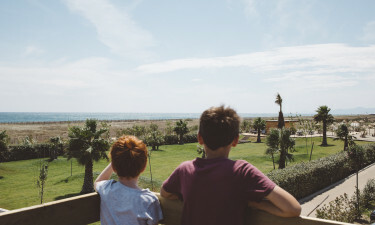 Why choose Camping Les Dunes? Safe swimming pool, with palm trees and sun loungers around the poolside. Restaurants, bar, hair salon, launderette and doctor's surgery (summer). Tennis, football, aqua bikes and petanque (French bowls). 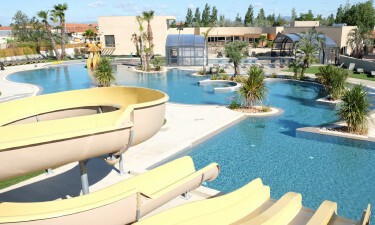 Awarded five stars, Camping Les Dunes has an indoor heated swimming pool and a big water park with slides and whirlpool baths. This new LuxCamp site is an excellent choice for luxury camping, poolside fun and seaside relaxation. Cross the dunes to beautiful, sandy Torreilles beach and have fun or relax in the fresh air. After a paddle or swim in the warm, clear waters, there are even freshwater showers to rinse off, too.